H is for Horses and hills, cannot forget the hills. Yesterday I did the Biggest Loser 15K with my daughter in Lexington, KY. It was a fun and well-organized race and the scenery was beautiful. 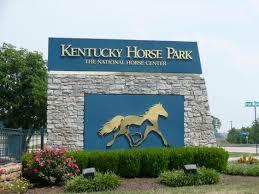 We got to run through Kentucky Horse Park which is beautiful and hilly. For those who do not know, KHP is about 1200 acres of rolling Kentucky Bluegrass horse country; it hosts world-renowned horse events every year. Part of the course was trail, but the bulk of it was on the private roads that run through the Horse Park. One thing about horse country is that there are lots of hills most small and rolling, only a few that were daunting and those were pretty spread apart; so it was not as scary as I first thought it might be. The energy of the race was fantastic, lots of runners cheering one another on to the finish. Because the BL 15k is a run/walk every level of participant was there; I love races like these they make you appreciate the human spirit and also what the human body can overcome. Why is that every time I race I come home and sign up for more races? A couple of weeks ago I signed up for the BL 15k and two other races, as of yesterday I am now committed to no less than three half marathons next year. Today is boot camp and also shopping day for my 21-days of eating healthy, this starts tomorrow. I took a week between challenges and now ready to go on to the next one. Have to think of another one to do after this. Posted on November 3, 2013 by elizagal •	This entry was posted in Health, Motivation, Running, Self awareness, The Journey, Uncategorized, Weight Loss and tagged Fitness, healthy-living, inspiration, Kentucky Horse Park, motivation, running. Bookmark the permalink.